Collegiate 3/4 Size Acoustic Guitar, PMICo N.Y. | SOLD | We have a soft spot for the odd and unusual and this little guitar sure fits the bill. It's labeled 'Genuine Santacilla Guitar P.M.I. Corp N.Y.' and sports the familiar 'Collegiate' decal on the headstock. Who made it is up for debate, although an argument could be made for the Oscar Schmidt Company in Jersey City, NJ. 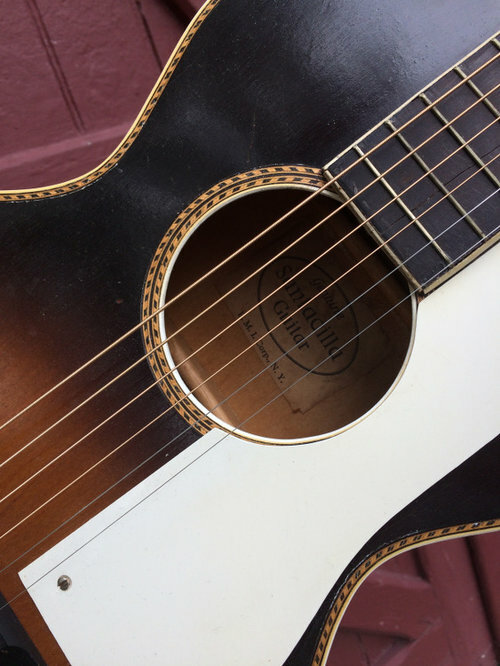 A few clues to support that notion: dot marker at tenth fret; square kerfing under top; curvature of the back; OS listed a 3/4-size guitar case in its '32 catalog; ink stamped numbers on the top brace below the sound hole (common on many OS instruments). Dating its manufacture is tricky, too. It's not a slot head, typical of many pre-1940s guitars, but, the tuners have the 'gear up' orientation indicative of pre 1928, and its likely original case has a latch that was pretty much out of favor by 1930-ish. Or maybe it was made from 'scrap' parts once Harmony bought out OS in the later 30s? Regardless of who and when, it's a snappy little guitar with some decent appointments. The body is solid birch, the top bound in 'rope' purfling and white celluloid. The sound hole is bound with a double row of 'rope' with a white celluloid finish. The neck appears to be poplar, has four pearl position dots and is bound in white celluloid. The fingerboard looks to be a tropical hardwood, maybe ebony, and not 'ebonized' pear wood common on catalog guitars. The neck, back, top and sides all sport a two-color sunburst. The original tuners are very clean, and have brass bushings in the peg head holes. Overall length is 33 1/8", with a scale length of 22 3/8". The lower bout measures 11 1/2" across. The neck is carved in a typical 'V', and measures just about 1 3/4" at the nut with a string spacing of 2 1/16" at the saddle. There are no cracks on the body, or anywhere else on the guitar. The only evident repair is a neck reset, with a rather gnarly fitting of the heel .. but solid. The ebony nut appears a replacement. The guitar retains its original end pin and its likely original case with leather-wrapped handle and purple lining, also in good condition. The guitar is not a toy, and feels good in the hand and plays easily with action set a 7/64". In fact, catalog listings for 3/4-size guitars target children and women. The sound is boxy, given its size, ladder bracing and body wood, but surprisingly full with good projection. 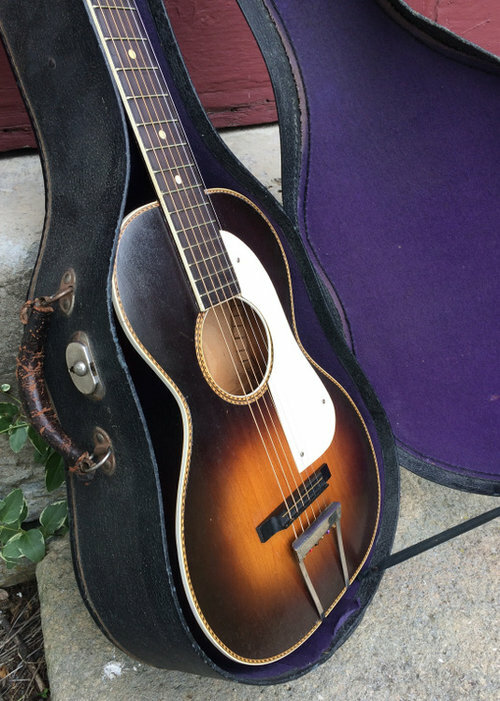 Overall, a very appealing, and quite rare guitar to an old-timey or bluesy finger picker, someone of smaller stature, or just as a travel or campfire guitar.